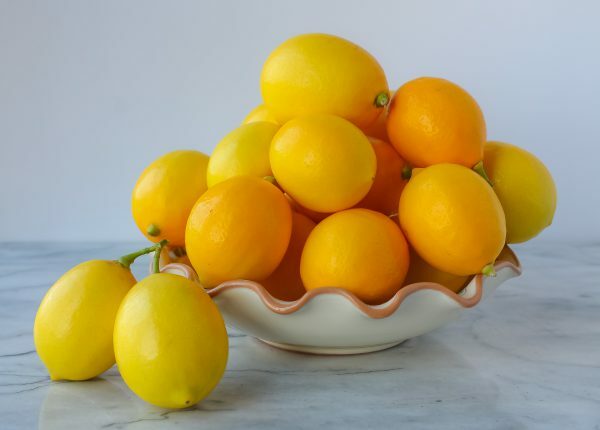 What looks more cheerful and bright than a bowlful of lemons, especially in the Spring. Who needs centerpieces when citrus fruits look so beautiful and inviting on their own, bursting like a ray of sunshine. But they also must be used for cooking because citrus makes everything taste just a little bit better. 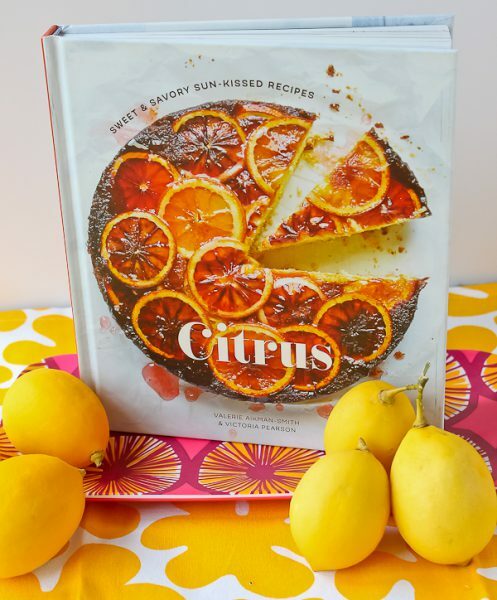 I only have a few cookbooks dedicated specifically to citrus, but this has quickly become my favorite. The recipes are easy to find, searching by lemon, lime, orange, tangerine, grapefruit, and “the rest” which includes the quirky or slightly out-of-the-ordinary such as the Buddha’s hand, yuzu, and kumquats. Dishes can also be found by course such as breakfast, starters, main dishes, salads, soups, sides, desserts, drinks, and pantry staples. I knew the minute I quickly flipped through this book, I was sold. Who could resist Meyer lemon and fresh thyme hearth bread, grapefruit and gin marmalade, rosemary lemonade, a slaw with fennel, olives and tangerines, handmade lemon pappardelle, scallops with smoky jalapeno and a tangerine relish, halloumi with a salsa of preserved lime, cucumber, and mint, or dark chocolate waffles with maple kumquats? This is only the beginning. 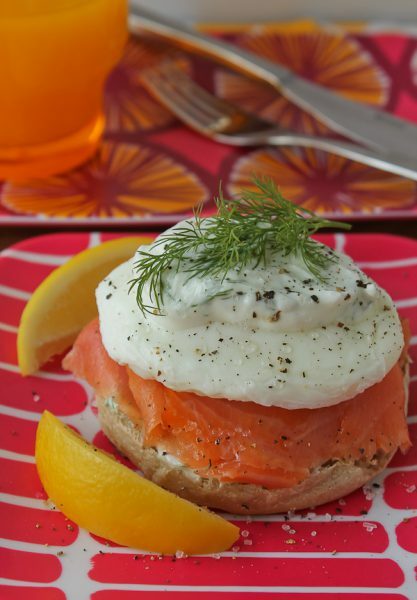 Since I was ready for breakfast and I love everything about this recipe with poached eggs, smoked salmon, dill, toasted English muffin, Greek yogurt, and lemon, I knew it would be a winner. Was it ever! Think of this as a simpler, lighter Eggs Benedict. 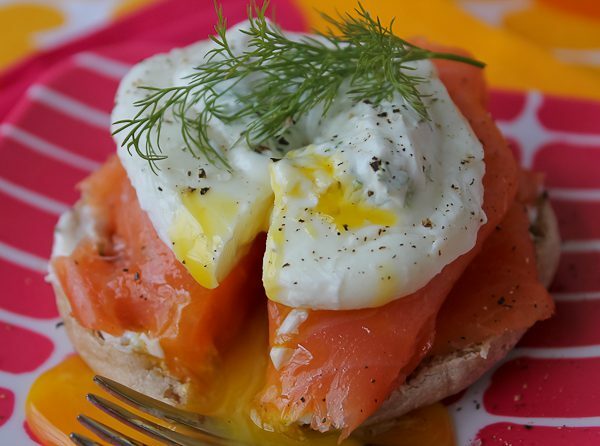 First make a sauce with Greek yogurt, zest and juice of a lemon, and fresh dill; then all you have to do is poach some eggs and toast a couple English muffins. A delicious and healthy breakfast is yours in minutes. I’ll be making this again and again. And wait until you cut into it! By the way, do you see the adorable and colorful dishes I used here? 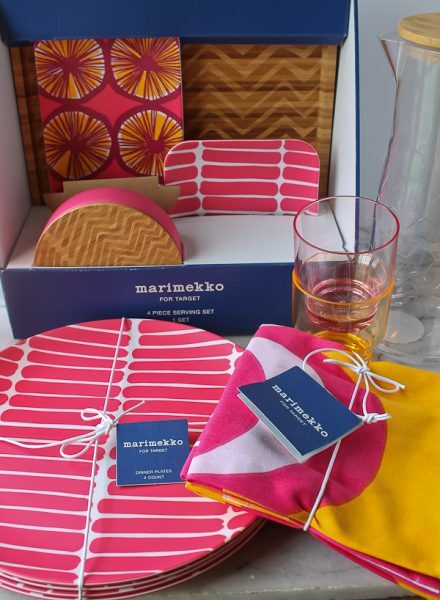 When Target announced it was going to have a Marimekko designer event, I was at our local store when they opened. I found some clothes for my girls and all kinds of dishes and kitchen ware for the three of us. This serving set was my favorite. 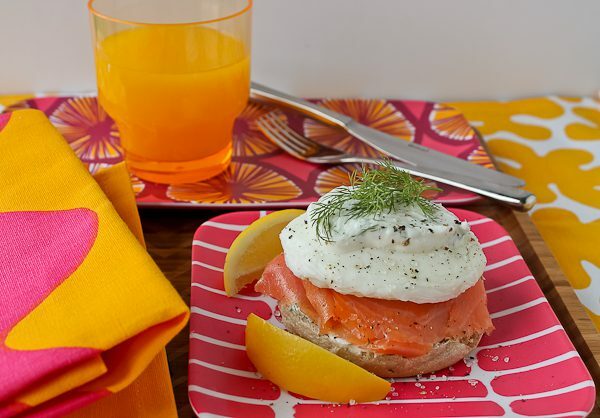 You don’t need the Marimekko for the lemony eggs, but they sure look cute on the those plates, don’t they? Here’s the recipe so you can try it too. And don’t forget to buy the cookbook. It’s amazing! Make Sauce: Whisk together in a small bowl the yogurt, lemon zest and juice, and dill, mixing well. Cover and refrigerate until ready to use, up to one day. Toast the muffin halves and place on 4 plates. Spoon a little lemon sauce on each muffin half and top with 2 salmon slices. To poach the eggs, fill a medium saucepan ⅔ full with water and bring to a simmer over medium heat. Add the lemon juice. Crack 1 egg into a ramekin or small bowl. Whisk the water to create a vortex and gently pour the egg into spinning water. Repeat with remaining 3 eggs, one at a time and gently simmer for 2-3 minutes. Using a slotted spoon, remove the eggs, shake off any excess water, and place on top of the salmon. Spoon more of the yogurt sauce over each egg. Sprinkle with salt and pepper and garnish with dill. Serve immediately with the lemon wedges on the side. Serves 4. Thank you for another enjoyable post! Your food staging (proper term?) is strikng – beautiful work! However, the best part for me is your writing. You are wonderful stoyteller, yet provide facts and information as well. On average, how many new recipes do you try each week or month? You made my day, Denise! Thank you for taking the time to write such a lovely note. It’s readers like you that keep me going! As far as how many recipes I try each week and month, it varies. There are some days when I will make and photograph several in one day when I am really feeling energetic, and some weeks I am dragging! What I can tell you for sure is, I never tire of cooking or writing this blog. It’s been 5-1/2 years and I am still loving it. And I truly mean it when I say it is readers like you who take the time to tell me how much you enjoy the blog that makes me want to keep up with those three-a-day recipe testings!